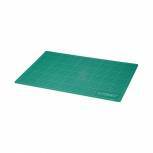 Q-Connect Cutting Mat A3 Green KF01136 Pack of 1 Q-Connect Cutting Mat. High quality cutting mat with a non-slip surface which closes behind the blade leaving a constant smooth surface for cutting time and time again. Double sided, with grid on one side. Size: A3. Colour - Green. Q-Connect Cutting Mat A2 Green KF01137 Pack of 1 Q-Connect Cutting Mat. High quality cutting mat with a non-slip surface which closes behind the blade leaving a constant smooth surface for cutting time and time again. Double sided, with grid on one side. Size: A2. Colour - Green. 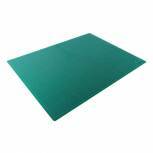 Q-Connect Cutting Mat A1 Green KF01138 Pack of 1 Q-Connect Cutting Mat. High quality cutting mat with a non-slip surface which closes behind the blade leaving a constant smooth surface for cutting time and time again. Double sided, with grid on one side. Size: A1. Colour - Green.